We are the Inner City Youth Orchestra of Los Angeles (ICYOLA), the largest majority African American orchestra in America. Founded in 2009, ICYOLA is a California 501(c)(3) nonprofit corporation that transforms the lives and minds of young people in Inner City Los Angeles through high quality music education. It teaches inner city youth the great music of the world, and provides opportunities for them to perform that music in the most magnificent settings of our community. It prepares its members for advanced study and high caliber success in music and otherwise, and instills the ancillary benefits that music instruction provides: problem solving skills, critical thinking, self-reliance, self-confidence, self-discipline, and the crystallization and pursuit of meaningful purpose. 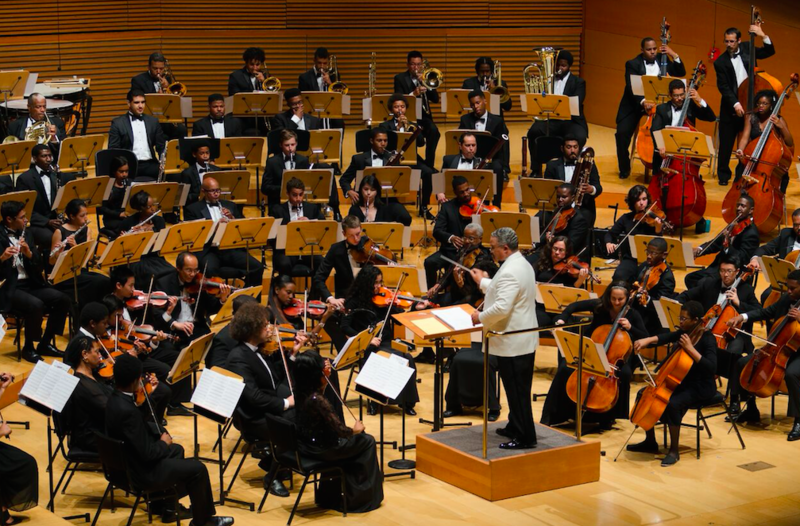 We play throughout South Los Angeles’ church community and at venues like The Getty Center, Walt Disney Concert Hall, Staples Center, and the Microsoft Theater. We opened our 2018-2019 Season on November 4 with a standing-room only concert at Holy Name of Jesus Catholic Church that featured the orchestra performing Variations on a Theme by Haydn, by Johannes Brahms and Symphony No. 101 by Franz Joseph Haydn. The concert also featured the world premiere performance of the South Central String Quartet, a brand new ensemble that is comprised of the Fellows of the Los Angeles Orchestra Fellowship. * The quartet performed the first two movements of Shostakovich String Quartet No. 10, and Violinist Sydney Adedamola was also featured in ICYOLA’s premiere performance of Astor Piazzolla’s Invierno porteno. December 24, 2018 // ICYOLA is honored and happy to participate in the 59th Annual Los Angeles County Holiday Celebration. The FREE bash is Los Angeles’ largest multicultural holiday celebration which gives special recognition to the rich cultures of the County. Celebrate a diverse group of L.A.-based artists as they showcase their talent and artistry on The Music Center’s iconic Dorothy Chandler Pavilion stage on December 24th from 3 p.m. to 6 p.m. All ages are welcome to attend. See it at The Music Center’s Dorothy Chandler Pavilion, or watch it on PBS SoCal & Stream it on pbssocal.org. Doors open at 2:30 p.m. Patrons may come and go throughout the three-hour show. Please feel free to visit HolidayCelebration.org or our click here for additional information about this performance.